In 1915, Louisette Texier’s father was hanged by the Turks in the midst of a large-scale extermination of Armenians. Lost, afraid, with seemingly no options left to her, Texier’s mother placed both of her daughters in an orphanage in Istanbul. When she returned to reclaim her daughters, she found they’d been separated and evacuated. Louisette was sent to Marseille, never destined to see her family or homeland again. The young girl was never adopted. She stayed in the system until she aged out, sent to a boarding school in the suburbs of Paris. But at age 15, already a rebel, Texier snuck out of school to become a cabaret dancer. Texier was determined to live a life full of independence. According to Fast Ladies by Jean François Bouzanquet, Texier saved up enough money in the world of dancing to open her own line of ready-to-wear clothing boutiques in Neuilly, a suburb of Paris, where she was among one of the first people to actually market jeans for women. As with many of the aspiring drivers in France, Texier’s racing career started at the banked track of Montlhéry. In the mid-1950s, women still weren’t the primary owners of vehicles—but Mdme. Texier, with a successful business and big dreams, was one of the rare ones who did. A friend named Georges Houel asked her to drive him out to Montlhéry to watch a friend race. It was there that Texier met the famous Jean Behra. So infatuated was he with rallying that he waxed poetic about it to the impressionable youngsters who had come out to the track that day. Something about his words struck a chord with Texier. 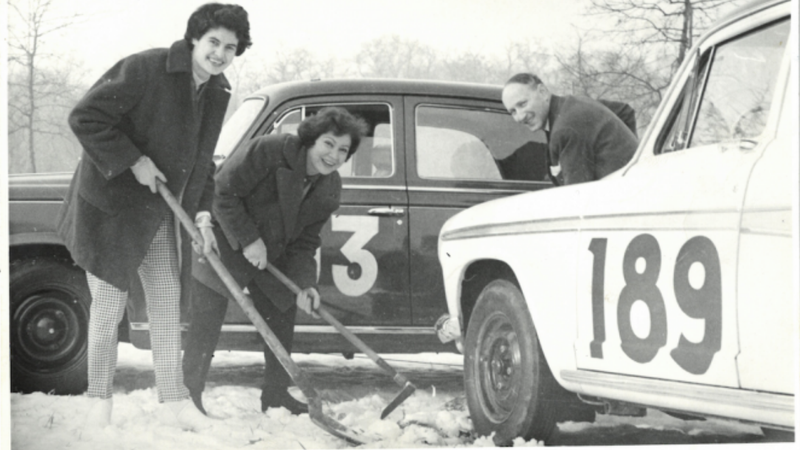 A few months later, she teamed up with Germaine Rouault to compete in the Monte Carlo rally. It wasn’t a stunning outing, given the fact that Texier was showing up with next to no experience. Out of 223 finishers, Texier and Rouault ended up in 119th place. But it was the beginning of the rest of her life. The experience thrilled Texier, her heart brimming with the excitement of competition. She bought an Alfa TI and started entering whatever competition she could manage—the only vacations she would take from running her business. Alongside Anne Soisbault, Texier won the 1960 Lyons-Charbonnières rally. Behind the wheel of Jaguar MK2, she won the 1964 Tourisme du Tour Auto Ladies’ Cup. She and Soisbault made quite the team; both were as capable of driving as they were of navigating, and they’d often swap roles. The hardships of her early life hardened Texier right from the start, earning herself the nicknames “Bulldozer” and “Le Louisette” (a cheeky reference to the guillotine). At Charbonnièrres, Texier smashed her windshield just in time for a pouring rain to start battering the field. Despite that, she powered through nearly 500 miles to finish third overall in race conditions that even the veteran drivers found near impossible. Being a woman in the rally world wasn’t easy. Some of her male competitors were known to fill the trunk of her car with heavy baggage when she wasn’t paying attention in an attempt to gain the upper hand on a woman who proved next to impossible to dishearten. One of her final rallies was the Tour d’Europe alongside Lise Renaud. Knowing that it was one of the most difficult rallies one could compete in, the two women made it their express mission to make it to get to checkpoints ahead of everyone else—if only just to touch up their makeup and hair to look as composed and relaxed as possible when the haggard, fatigued men started clocking in. Louisette never really stopped racing. She just took a break from competing. She found success in her business and began to build a family (although she did divorce her husband, claiming that she preferred to live her life to the fullest and had gotten tired of men trying to control her). Texier is still alive at 105 years old and, despite needing a walker to get around, she still doesn’t hesitate to hop in a go-kart and challenge her grandchildren (and great-grandchildren) to a race. Hell, she was even taking off to Africa at the spry age of 80 for a chance to get behind the wheel in unfamiliar territory. Texier was a stunning driver in her day, someone with a dazzling personality and the rare ability to balance a successful business and a successful racing career during her prime. This series has covered plenty of women whose careers were cut short by outside forces—war, economic depression, you name it—and it’s refreshing to find a woman who was not only able to overcome the hardships she endured in her own life but was able to turn that into success all across the board.